If you have had fire damage tear through your home, you understand how much of a mess you have on your hands. That’s why we at SM Absolute are happy to help you pick up the pieces and restore your home to the way it was before. 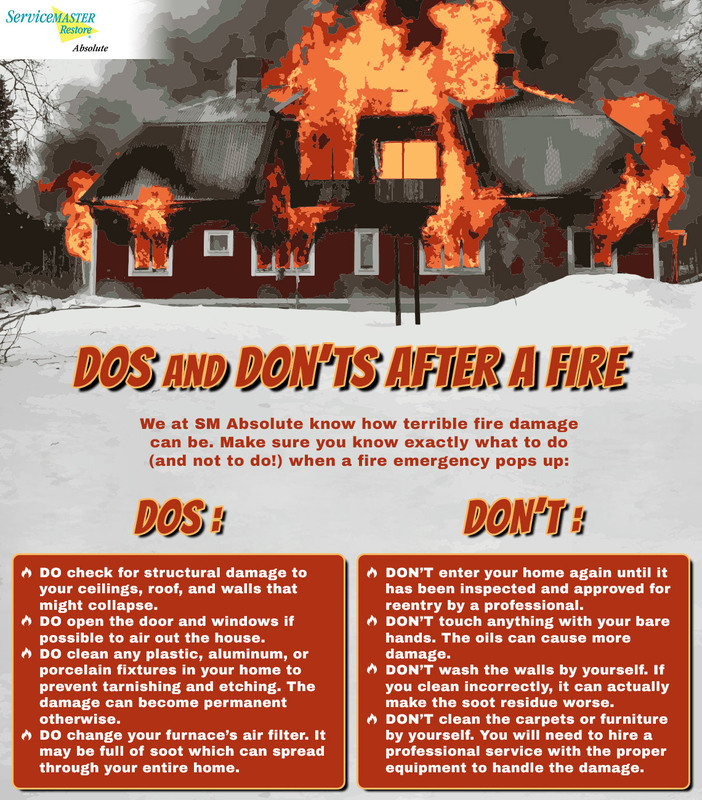 While there are many things you should absolutely do after a fire strikes your home, there are also things you need to avoid in order to prevent further damage. Read this list we have compiled to learn more. Open up your doors and windows: Assuming that the weather permits it, open the doors and windows in your home to help air out your home and remove the smell of smoke. However, if it is not safe for you to access certain windows, stick with the ones you can access. Clean what you need to: Any items and fixtures that are made of plastic, chrome, porcelain, and aluminum need to be cleaned immediately after the fire. Otherwise, the tarnishing and etching left behind may become permanent and the item may have to be replaced. Change the air filter on your furnace: Unfortunately, many furnaces use forced air to circulate through the home. When your filter is full of soot and germs from the fire, you will want to ensure that it won’t be dispersing these contaminants through your home. Use damp cloth over return and supply air registers: This will help catch any loose soot drifting through your home. Even if we clean your home entirely, there may still be a few flecks of soot through the air for a short period of time. Don’t go back into your home until it’s all clear: Make sure that a professional has okayed you and your family to enter your home again. Walls, floors, and other fixtures may not be stable and could potentially collapse. Don’t touch anything with your bare hands: Your hands have oils on them which can often worsen a situation when you touch the walls or certain fabrics. Don’t wash the walls by yourself: While soot may look easy to wipe off, it can actually make a bigger mess if you do not have the proper tools and supplies. Don’t clean by yourself in general: You may be confident in your ability to clean your carpets and your upholstery, but fire damage can leave behind greater issues than your everyday cleaning supplies can handle. Only professional level tools can tackle these. If a fire has damaged your home, there’s nothing to worry about. The professionals at SM Absolute are here to help you figure out what to do and take care of the mess for you. Call your Corona fire damage restoration professionals today to learn more about our services and how we may be able to help your home!